The shutdown of six taxi ranks and routes in Soweto took effect from Friday morning and will be closed until further notice. 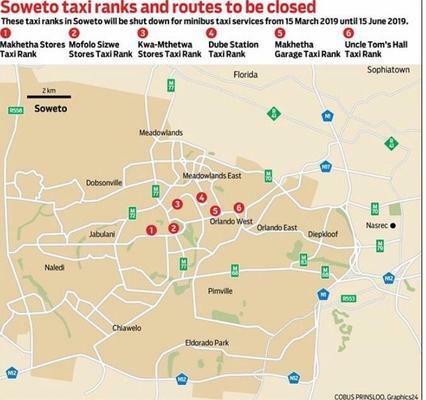 More than one hundred police and traffic officials have been deployed in Soweto to monitor closed taxi ranks and routes, said MEC for roads and transport Ismail Vadi in a statement on Friday. “In terms of the published Regulations No.80 (Volume 25), no person is allowed to operate minibus taxi services along the specified ranks and routes in Soweto. “A person is guilty of an offence if he/she operates minibus taxi services in contravention of the regulation,” said Vadi. He said where a person was convicted of contravening this regulation, a term of imprisonment not exceeding six months or a fine not exceeding R25,000 may be imposed. Vadi said he had noted a signed agreement between the two associations and said that he was willing to consider further constructive representations on the matter.